Great Britain officials decided to celebrate the Summer Olympics with a dozen of large-scale projects representing arts of different regions of the country. One of these projects is a 6 meter high puppet of Lady Godiva who is considered as the symbol of Coventry. She was transported from Coventry to London on a 'Cyclopedia' that included a horse, throne and helicopter-style tail. Artec scanners , with Patrick Thorn's help, were used during the creation of this gigantic vehicle. The other 11 projects are are intended to represent Northern Ireland, Scotland, Wales and other parts of England. 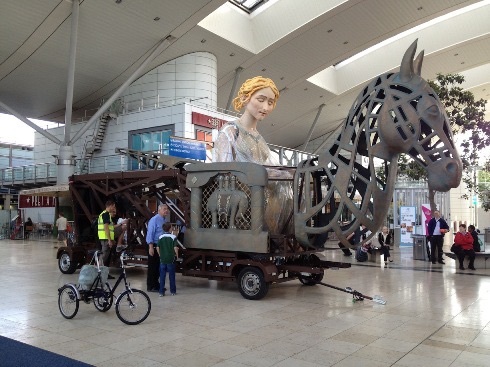 A 6 meter high puppet of Lady Godiva has already started its journey from Coventry to London to celebrate the Olympics. The puppet riding a horse is transported using a special system called the Cyclopedia powered by a team of 100 cyclists. Main difference from the real Godiva who rode naked is that the puppet is dressed in an embroidered coat which was created by a team of designers from West Midlands. Artec 3D scanners were actually used to create the large scale horse for famous Lady. First John Owen hand sculpted the horse using automotive styling clay. Then this life-size figure was scanned by Artec MH which managed to capture even the smallest details of the sculpture and helped to create the exact 3D model of the horse. Afterwards this model was scaled and 3D printed for a 1/10 scale model, smaller parts were made on the Roland MDX540 and larger parts for the final moulds were made on the Thermwood M67. According to legend Godiva was a beautiful wife of Earl Leofric. People of Coventry were suffering from her husbands’ excessive taxation and Godiva was constantly requesting to reduce the taxes. Earl Leofric was so tired of her entreaties that he once promised to grant her request if she would ride through the streets of the city naked. He was sure that Lady Godiva would never agree to do this but she took him at his word. People of Coventry who really loved and respected Godiva decided to stay indoors and shut their windows on the assigned day so Lady was able to cross the city unnoticed. Struck by her dedication Earl Leofric kept his word and reduced the taxes. For complete coverage of Lady Godiva story go on BBC.